I finally had the opportunity to start playing around with Adobe Dimension. Since 4 months back I have visualized this clear composition I want to create, and the best part is that I now have all the elements to create it. First off, as its the first time I am actually able to use Dimension, I closely read and watched the short 17 step instruction tutorial. It was helpful to give me a quick overview of where the tools are located. The workspace is similar to Photoshop, so it came a bit innate for me. Then the fun began, I started dragging and dropping the 3D models around, it was like being in a candy store, and The notion that Adobe Stock has even more 3D models had me excited. 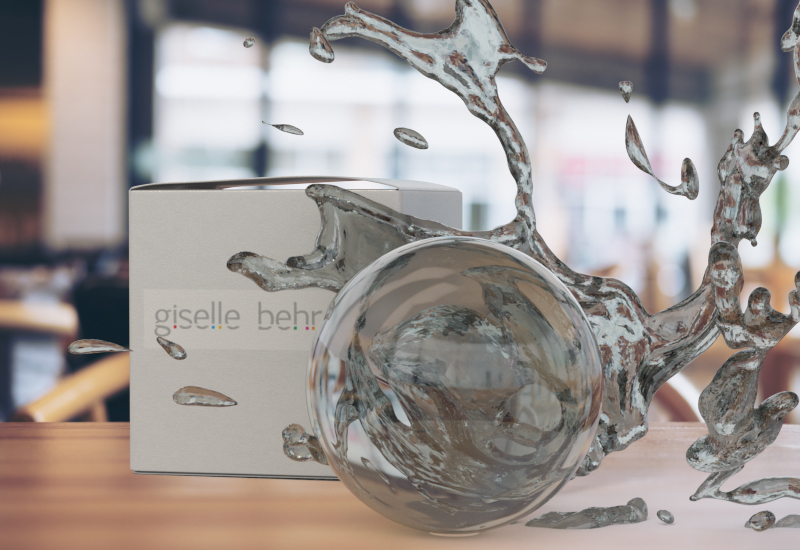 I selected a box, a sphere, and a splash. Then I went to the skin texture tab, and added the glass texture to the sphere and splash, and white plastic to the box, then I slapped on a “decal” with my logo on it. Chose the table background that comes with the software, et voila, c’est finis! Next I went to the rendering tab, and waited for the image to render. And waited. And waited. And left the computer on all night long, and in the morning I felt I had a gift waiting for me and when I saw, nothing yet. I didn’t understand. I took a closer look and it turns out I went to the tab but never clicked on “render” duh!! So I clicked away and in 2 minutes had a low-res rendered version, that was so exciting, my very first 3D composite! I opened it in Photoshop, but noticed it is only 72 dpi, even at high res, so I need to play around more with it and see if I can change it to at least 200-300 dpi. Next I will start creating my envisioned photographic composite, can’t wait.